What happens when a young woman enters a city apartment early morning, with two footballers? Jordi Spence is sixteen years old and lives in outer Melbourne. By daybreak, her world has shifted. Max Carlisle, a troubled AFL star, can't stop what comes next. And Ruby, a single woman from the apartment block, is left with questions when she sees Jordi leave. Question: What inspired you to write Siren? Rachel Matthews: Siren was part of a PhD at Victoria University where I looked at sexual violence in Australian Rules football. I was interested in examining the culture in which the problems exist. What I discovered was that there was no Australian fiction that dealt with the woman's experience in a complex way and explored the reality. I also discovered that the attitudes, language and crimes that take place are much bigger than football. I wanted to also present a sympathetic voice for the men in this space who are unable to speak up. Rachel Matthews: I like to write about people who often don't have a voice, marginalised groups that are sometimes misrepresented in the media and in fiction and film. I like to challenge stereotypes and labels and show people as complex. 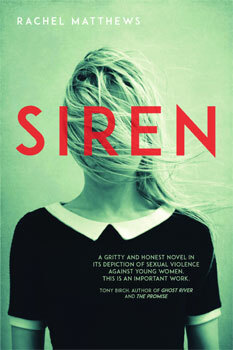 Rachel Matthews: The earlier versions of Siren were very shaped by the exegesis or research part of my PhD. As I dug more into my studies it became more apparent that violence is just as much a product of language and beliefs as it is a physical response. Question: What do you hope readers get from the book? Rachel Matthews: When you work on something for so long one of the joys is being able to share your story with readers. The hope is that it can be useful in some way or challenge and contest the problem. Fiction is a great space to start conversations and look at something from a different perspective.